Over the last few months, I have been participating in a study at my church of the book Shepherding a Child’s Heart. This book has been eye opening to me and I thought I’d share my personal feelings and thoughts about it with all of you. The basis of the book is raising your children in a godly biblical way. So often in our society we are caught up in the pop psychology of child raising that we stray so far away from how we are supposed to raise them. I personally have tried many of the “tried and true” methods, including a ton of SuperNanny’s tricks and none of them have worked with our son. Why? Because they don’t get to the heart… they just focus on getting your child to do what you want them to do. The main purpose of this book is to get you to focus on the heart and the attitude of the heart, to teach your child that God has placed you as the authority in their life to protect and guide them and that you serve as their authority under God. Once you teach the heart to love and to serve, the behavior changes. It’s not only teaching your child’s heart, but it teaches your heart along the way. Tripp explains the two biblical methods of discipline are the rod (spanking) and communication. He goes into great depth in explaining the appropriate way to spank and how not spanking puts your child in peril spiritually. It was difficult for me to read this because my husband and I had decided not to spank because we had seen how upset we got with our son and felt like we didn’t want to spank in anger. Godly discipline is NEVER done in anger, but in love. Doing it in love prevents abuse and actually leads you to a stronger relationship with your child. Since implementing this type of discipline, we have seen how differently we address our child’s behavior and how he is learning that we love him and that is why we aren’t letting “this one go”. It’s a hard way to parent, but it’s the right way. Tripp also goes into great detail about why the typical methods of discipline don’t really work and why as our children get older, they will rebel. It’s really eye-opening! It’s no wonder children are so rebellious these days and why so many are doing things that we never would have thought of at such a young age. Parents are taking the easy way out. The only negative I have to say about this book is that there isn’t a lot of practical application examples. However, through the Shepherding the Heart Ministries, a variety of tools with examples that are very helpful are offered. Ginger Plowmann offers a great supplemental resource in her Wise Words for Wise Moms chart that gives scripture references in dealing with specific issues. The book does have review and thought provoking questions at the end of each chapter which are helpful in getting you to really understand the concepts. All in all, this is a fantastic book written by a father, teacher, counselor and pastor. With years and years of personal experience, his insight is clear and heartfelt. He lets you know the struggles his family has had with certain things and he gives examples of how raising your child biblically makes all the difference in the end. I highly recommend this book to anyone. Have you read this book? Would you recommend it to other parents? I should be drinking whole milk while I’m pregnant? And better than that is unpasteurized, raw milk? I should stay away from a low-fat diet? Especially while I’m pregnant? It’s okay to feed my baby meat? So, can I or can’t I eat fish while I’m pregnant? Industrial fats like corn, sunflower, safflower, and soybean oil are making me fat and causing heart disease and diabetes? You mean butter, coconut oil, and lard are better choices? What foods are good to introduce to my baby? You mean babies don’t NEED cereal when they first start eating? Are you crazy? 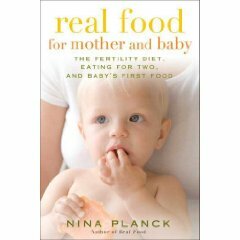 I recently read Nina Planck’s book Real Food: What to Eat and Why based on the recommendation of a friend. Thanks Heather! She also recommended Planck’s next book, Real Food For Mother and Baby. When she told me that the book explains why mothers need more than iron and folic acid when they are pregnant and even trying to conceive a baby my interest was piqued. This book will turn many of your thoughts about food upside down. Nina is aon a mission to help people understand why it is important to eat “real food”. Real food is food that people have been eating for thousands of years. The kind of food that is minimally processed–meaning milk that comes straight from the cow, beef that is fed grass not soybeans and corn, grains that have been soaked, plain yogurt with your own added flavor, poultry that is allowed to roam and eat grass and bugs. You get the idea. Planck makes the argument that “industrial foods” are ruining our health. Soybean, corn, safflower, and sunflower oils are commonly added into our foods. They are also highly processed and increasing our bad cholesterol. The information in this book will make your head spin because it demystifies so much of our wrong thinking about food. This book addresses all those questions I wrote above. The first chapter is basically a summary of her first book Real Food. I highly recommend reading her first book to get more of the science and information behind her food recommendations. It is eye opening. Chapters 2 and 3 deal with pregnancy and nutrition during pregnancy. Chapter 4 covers breastfeeding. This chapter may make your eyes get as big as saucers in some parts but it is interesting all the same. She covers why breastmilk is best for baby, what she would do if she had trouble nursing her baby, how formula is made, some of the basics of getting baby to breastfeed and even some anthropological implications for why we have to nurse so often. 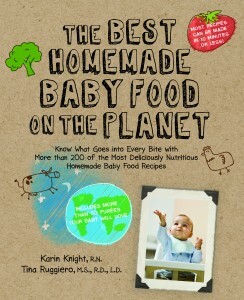 Chapter 5 covers first foods for your baby. This chapter has seriously made me rethink how I want to introduce foods to any additional children we may have. This book, along with her first book, has caused me to reconsider the kind of foods I want our family to eat. One thing that I really appreciate about her approach is that she recognizes that eating a traditional, REAL FOOD diet can be pricey. Time magazine just had an article covering the benefits of grass fed beef for farms, farmers, and consumers. The article showed how it is cheaper to buy unhealthy, industrial food than healthy, traditional foods. Many of us are on strict budgets and have difficulty paying for free range chicken and grass fed beed for every meal. She encourages people to pick and choose wisely and get the best that you CAN afford. Can’t find raw milk? Then buy organic whole milk. Can’t afford organic? Then at least drink whole milk. She does recommend that we stay away from all foods that come with industrial indredients and not to fall prey to marketing schemes that tell us that processed foods are good for us. When we get to England I am planning on implementing several things in the books I have been reading in the last few months about food. One thing I want to do is avoid ALL forms of industrial food: corn oil, high fructose corn syrup, soybean oil, white flours, processed grains, powdered skim milk…you get the idea. It seems almost impossible but I’d like to try it for at least a week and see how we do. I figure since we are moving to a different country it might be easier to stop buying some of our industrial food culprits. Have you read this book? What do you think? Does the idea of drinking whole (raw) milk freak you out? Eating whole, unprocessed, real, traditional foods has been getting a lot more press recently. What have you heard?